Online local search service company Just Dial Ltd, on Wednesday, reported a dip in the net profit for the second quarter of the current financial year. Net profit for the quarter ended September slid to Rs 29.62 crore against Rs 40.49 crore in the same quarter last year, the company said. Operating revenues, however, grew 10% from Rs 163.86 crore to Rs 180.32 crore in the quarter in question against the same period in the previous year. The company said in a statement that it did approximately 4,08,800 campaigns during the stipulated period for its paid advertisers against 3,49,800 campaigns same quarter last year, representing a growth of 17%. The number of listings also saw a growth of 7% for the quarter ended September at 16.9 million compared to 15.8 million listings in the same quarter of the previous financial year. VSS Mani, managing director and chief executive officer of Just Dial, said: "We are seeing encouraging signs on the growth front from steps that we initiated in the past few quarters and we expect the momentum to strengthen. We remain hopeful of getting back to sustainable growth trajectory in the coming quarters." The Mumbai-based firm's stock closed at Rs 447.95 on Wednesday on the Bombay Stock Exchange. Last week, Just Dial's chief technology officer RV Raman had quit the company. He had joined as CTO in January this year. 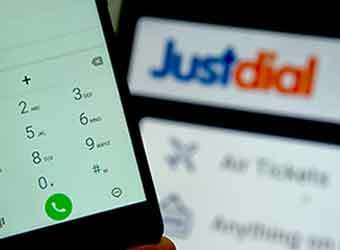 Just Dial has seen exits of two technology heads in quick succession. Raman's predecessor Sandipan Chattopadhyay had stepped down in December last year. The company currently has 11, 799 employees.